Between storms I’ve been scouting for flowering plants that really hold up to pounding rain. Sure pansies, primroses and cyclamen are pretty but they’re looking a bit beat up about now. I have been impressed with many flowering shrubs and trees that are happily blooming despite so much rainfall this winter. As I write this during another series of storms, my weather station here in Bonny Doon has recorded 85.06 inches of the wet stuff this season with 39.76 inches of that having fallen so far in January alone. I have put out straight sided containers on several occasions to double check my gauge with an old fashion ruler. Yep, the weather station is accurate. All this rain makes me have even more respect for the flowering plants that are holding up to the weather. These plants are my heroes and you might consider including them in your garden too. One of my favorite small ornamental trees, blooming several times a year, is the Autumnalis flowering cherry. It blooms in the spring, a little during the summer, again in the early fall and then another round of blossoms show up in December and January. I’m not sure how it got the name Autumnalis ‘cause it sure can’t read a calendar. I was afraid I would loose the winter show with so much pounding rain but the pale pink blossoms have come through just fine and and chickadees who land in it before going to the feeder remind me that spring will be here before I know it. Also here in my own garden the hellebore flowers are holding up well. One of my favorites is called Cinnamon Snow but all of the varieties of this buttercup relative accept wind, rain, cold and less than perfect soil while getting by with only moderate watering in the shady summer garden. Deer aren’t attracted to them either. Recently, after seeing a Pink Australian Fuchsia blooming so profusely despite the rain, I decided to add a variegated variety called Correa ‘Wyn’s Wonder’ to my own garden. Although not related to hybrid fuchsias, the flowers are similar and their nectar will feed the Anna’s hummingbirds. They grow well in dry shade under oaks are deer resistant and drought tolerant. A favorite of birds and indoor floral arrangers is the evergreen mahonia. Plant a mahonia if you want to attract winter hummingbirds. They are blooming now with bright yellow flower clusters that will last for months. Each flower will set a purple berry looking like a cluster of grapes. The edible berries make good jelly, too. There are 70 varieties of mahonia including our own native Oregon Grape which grows in the understory of Douglas fir forests. Mahonia aquifolium is resistant to summer drought, tolerates poor soil and doesn’t create a lot of leaf litter. Other tough winter blooming plants include winter daphne, abutilon, witch hazel, edgeworthia, camellia and grevillea. Driving around I’m seeing that the Saucer Magnolia’s don’t mind the pounding rain either. Enjoy color in the garden regardless of what Mother Nature brings our way. It probably won’t come as a big surprise to you that I have a lot of friends that are also landscape designers. We get together to talk plants, garden design challenges and plant problems while enjoying good food along with a little wine thrown in for good measure. Recently I had the opportunity to visit one of these friends and although I was only there briefly to pick up something I couldn’t help but ask about several of the beautiful plantain her own garden. Some of her favorites include those with interesting foliage and texture and that flower over a long season. Maybe some of these plant ideas will work in your own garden. Being winter and all I was immediately drawn to the hundreds of soft apricot and creamy yellow flowers covering a 3 foot wide Peruvian Lily. This selection of alstroemeria, called Inca Ice, is much shorter and compact that the taller ones that can be somewhat floppy in the garden. Alstroemeria were named by Carl Linnaeus, often called the Father of Taxonomy, for his friend and student Klaus von Alstroemer. Native to South America, the summer growing types come from eastern Brazil while the winter growing plants are from central Chile. 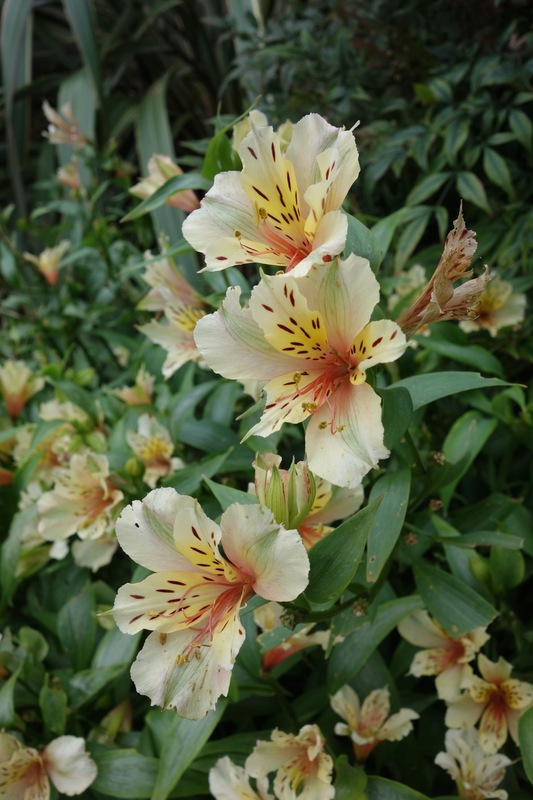 Peruvian Lily spread slowly outward from rhizomes and grow in full to part sun. They are hardy to 15-20 degrees and can tolerate dry conditions although they look best with irrigation. The Inca series grows 2-3 ft tall and can be covered with flowers from spring to late fall or winter if the weather is mild. The flower stems are long enough for cutting. This variety also comes in light orchid, pale yellow and white with red and green markings. What’s not to love about this plant? 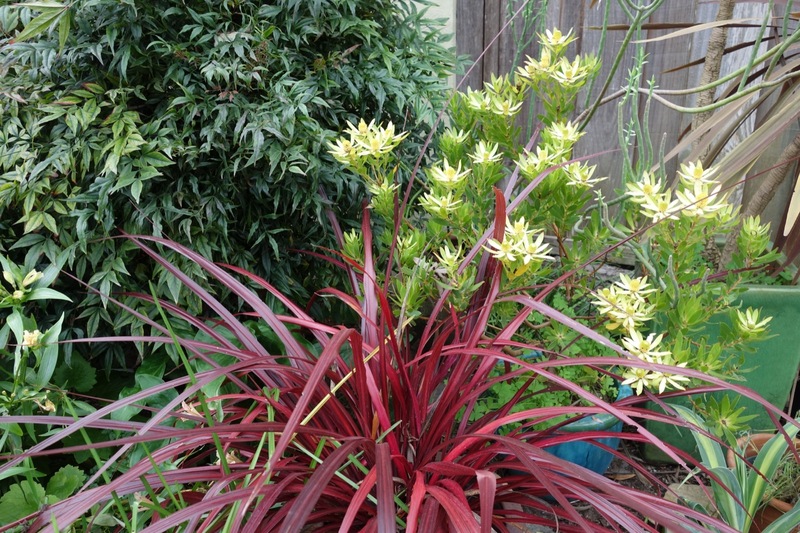 Tucked next to the blooming Inca Ice Peruvian Lily, a clump of bright, burgundy red Festival grass complemented the soft yellow of a Leucodendron discolor and a variegated Flamingo Glow Beschorneria. I was not familiar with this variegated agave relative with its soft-tipped chartreuse striped leaves. I found out this beautiful plant is drought tolerant, hardy to 15 degrees and will bloom with 5 foot pink stalks with reddish pink bracts. Other plants that boast more foliage color than flowers brought this winter garden to life. Several varieties of helleborus just starting to show pink, white and rose color were surrounded by the brilliant chartreuse-yellow foliage of sedum Angelina ground cover. A variegated Japanese Lily-of-the-Valley shrub grew nearby getting ready to bloom soon. Beautiful bright pink, cream and green variegated Jester Leucodendron bordered the driveway. I’ve seen this plant also called Safari Sunshine in nurseries. With its smaller size of 4-5 feet this evergreen shrub has showy, rich red bracts that sit atop the branches now in late winter and lasting into spring. Drought tolerant like Safari Sunset and deer resistant, too, leaucodendron are hardier than other protea. Every interesting garden has good bones. It has focal points, texture, repetition and unity among other elements. My friends garden is no exception. A lovely caramel colored New Zealand Wind Grass dominated another area allowing my eye to rest for a while. I wish they would quit renaming this plant that used to be stipa arundinacea but is now anemanthele lessoniana. The name doesn’t exactly roll off the tongue but the effect is beautiful in the garden. I’ve always called it Pheasant Tail grass but I could find no reference as to why this common name is used. Life used to be simple before DNA sequencing! So if you’re in the mood to add a couple of interesting plants to your garden, take a tip from what a landscape designer grows in her own garden. ‘Tis the season… to enjoy your garden from inside on a wintry day when the weather is cold and blustery. Why not dress up your entrance with winter blooming plants to welcome you home or place them where you can see them outside a window? Besides bedding plants like primroses, violas and pansies, there are colorful shrubs that bloom during the winter. Here are some good additions to your garden to brighten things up. Yellow is always a cheery color in the garden at any time of year. The deep golden flowers of Mexican marigold or tagetes lemmonii are carried on branch ends sporadically all year, peaking in winter and spring. Finely divided leaves are strongly fragrant when crushed and smell like a blend of marigold, lemon and mint which is why deer avoid them. Prune them lightly to control shape and size. They grows 3-6 ft tall and as wide. Another shrub that blooms all winter and has yellow daisies is euryops. They, too, are deer resistant and grow to about 3 ft. If you have a little more space, try ‘Rose Glow’ leptospermum near a ceanothus ‘Concha’. The contrast between the deep red flowers of the tea tree with the bright blue flowers of the California lilac will certainly get your attention. These larger shrubs reach about 6 ft tall and as wide. Camellias are another great shrub that start blooming in the winter. Actually, Camellia sasanqua start flowering in the fall and some like the popular red ‘Yu letide’ bloom right at Christmas time. ‘Chansonette’ is another beautiful variety with rich pink flowers. Sasanqua camellias can tolerate a little more sun than the more common camellia japonicas. They come in a variety or forms from compact shrubs to open vining types that can be espaliered. If you don’t have any of this variety they would make a good addition to your garden. has been the standard in U.S. and European gardens since the 1800’s when they were introduced from China and Japan. Their flowers range from formal types like my favorite, ‘Nucchios’ Pearl’ to anemone form, rose form and peony- like flowers . Their flowering season can be early (Oct-Nov.), midseason (Jan. – March) or late ( March – May ) which is why it seems that camellias are always blooming. The flowering trees and shrubs of tropical Maui are behind me and I’m back in our temperate rain forest of redwood trees and all things green. Sure, a few early blooming shrubs are flowering this time of year and are a welcome sight but I look for color in other places. If you’re looking around your garden now and seeing mostly green, here are a few suggestions to brighten things up. Native to moist places from Northern California to Alaska, the Red-twig dogwood is stunning in the fall with its brilliant red foliage. In the winter, dark red stems provide a nice contrast to evergreen plants. This multi-stemmed shrub grows rapidly to 7-9 ft high and spreads to 12 ft or wider by creeping underground stems and rooting branches making it good for holding banks. Shade tolerant with small fruits that attract birds follow 2" clusters of creamy, white flowers in the summer. Looking for a plant that’s deer-resistant, beautiful and has edible stems, too? Plant a few cherry rhubarb among your other perennials in a sunny or partial shady spot. Leafstalks have a delicious tart flavor and are typically used like fruit in sauces or pies. The leaves are poisonous, however, which is why deer avoid them. If a tree has showy bark in winter it earns it keep in the garden. Marina strawberry tree has rich, reddish brown shredding bark on branches that tend to become twisted and gnarled with age. This evergreen tree is also pretty in the fall and winter when rosy pink flowers appear at the same time as the strawberry-like fruit. It’s a good garden substitute for its relative, the native madrone, and performs well in a wide range of climates and soils. I also like my Coral Bark Japanese maple in winter for its striking red twigs and branches. Upright and vigorously growing in fits into narrow spots. I really like the bright yellow fall foliage, too.